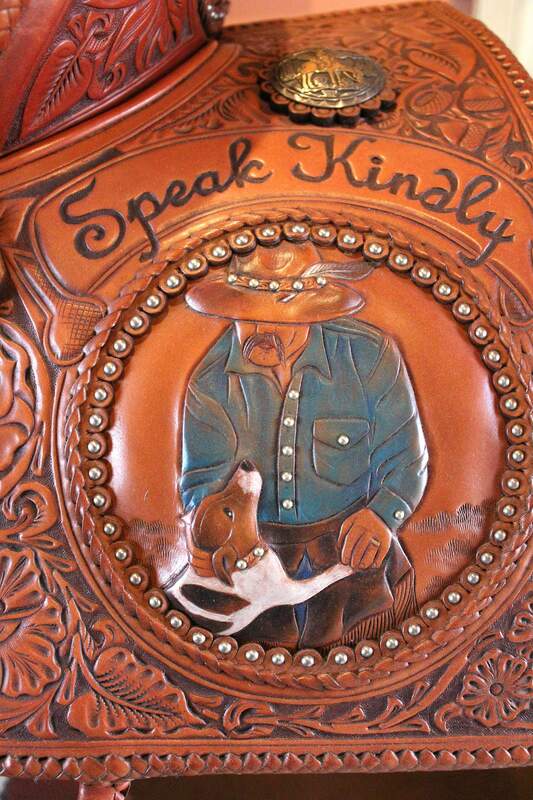 A detail of a Skyhorse saddle is actually a self-portrait of Loren and one of his dogs. 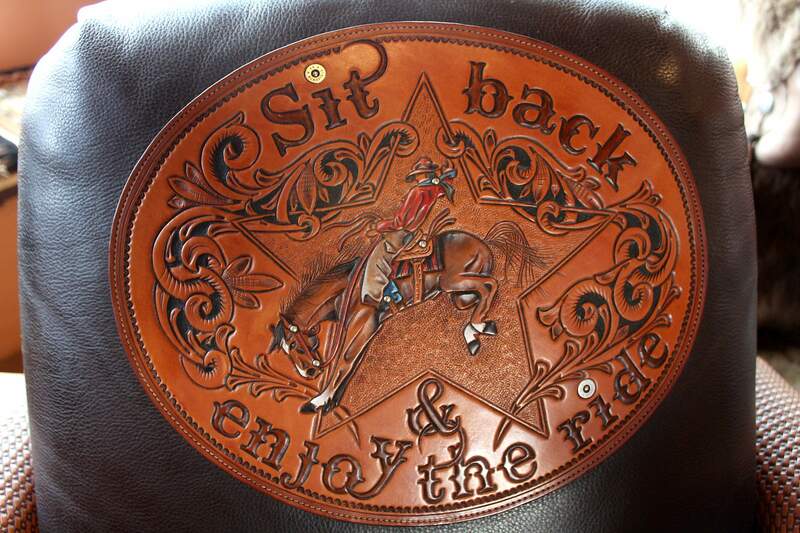 The saddle has several phrases etched into the leather including “Speak Kindly.” The Skyhorses produce elaborate themed saddles. 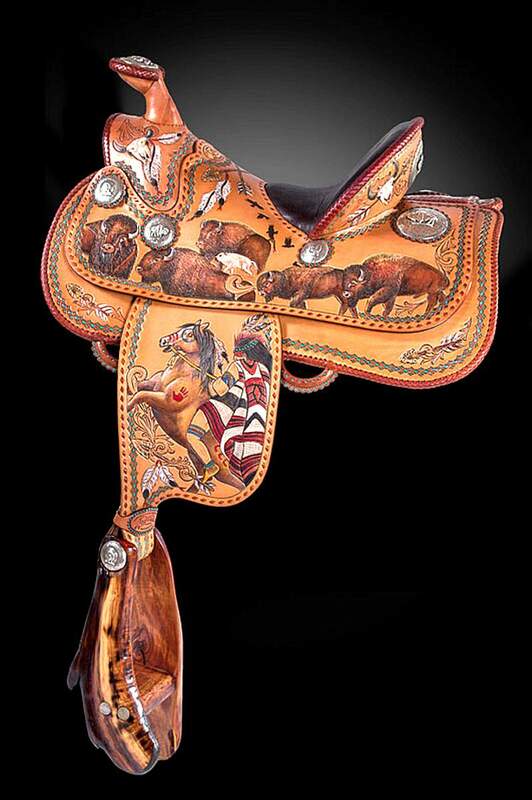 This is a Skyhorse saddle graphically depicting a Plains Indian buffalo hunt. 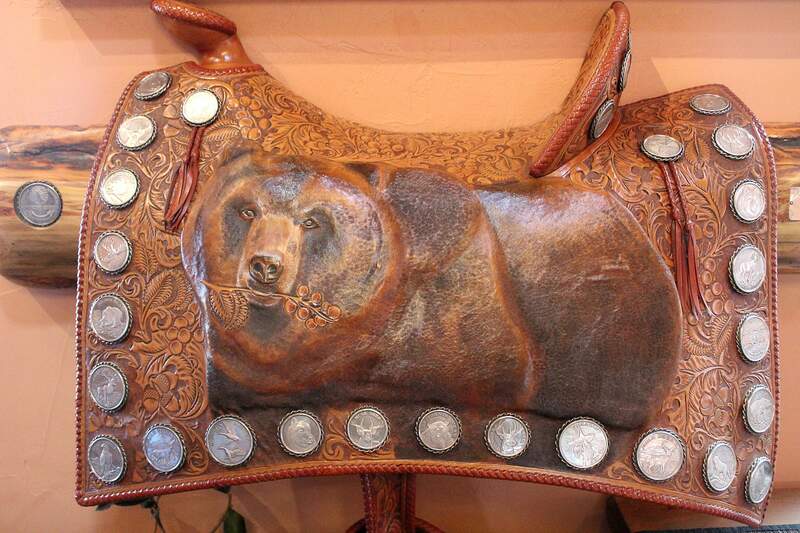 Known as the White Buffalo Calf saddle, it was hand carved and painted by Lisa with braiding by Loren. 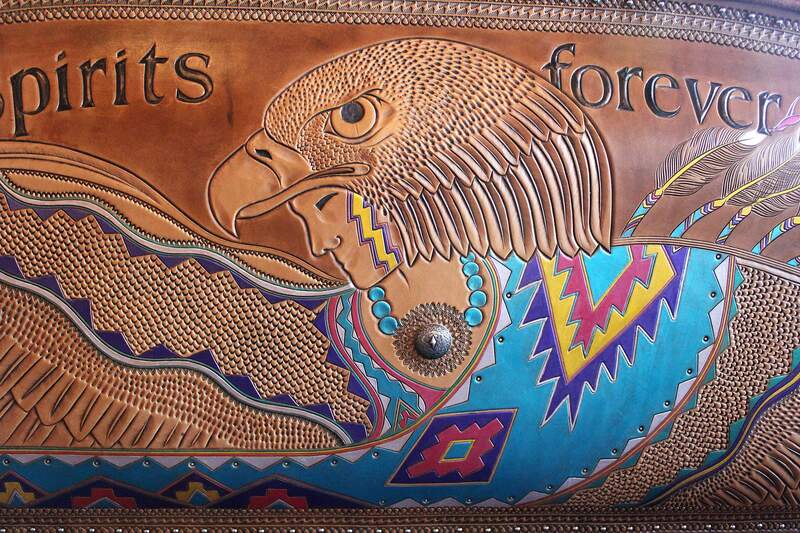 Each side has a different hunt scene. 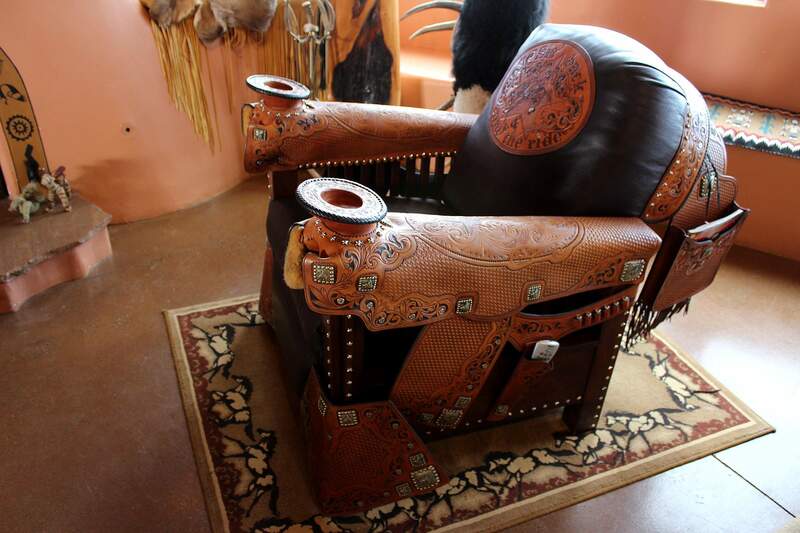 Lisa began as a saddlemaker decades ago in California when her biologist boyfriend Loren was under contract to shoot predators. 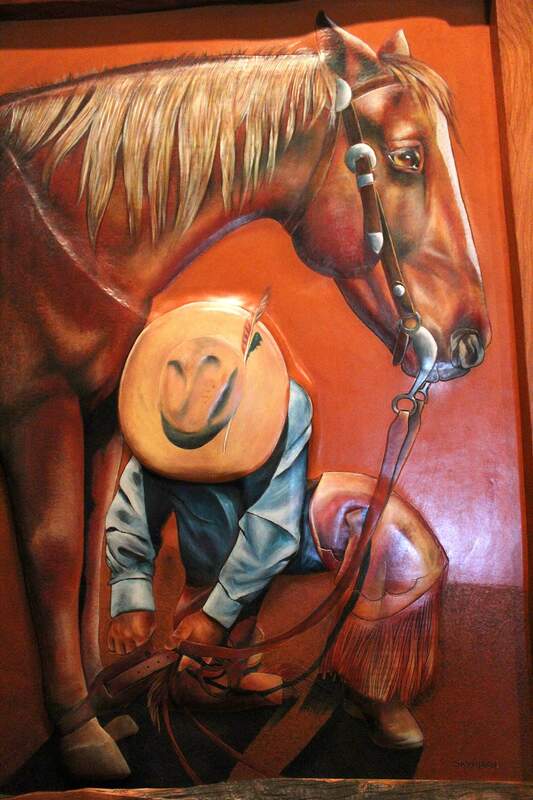 He’d come visit her stinking of coyote urine, yet she saw something more in him than his dirty blood-specked jeans. They married. Became a team. 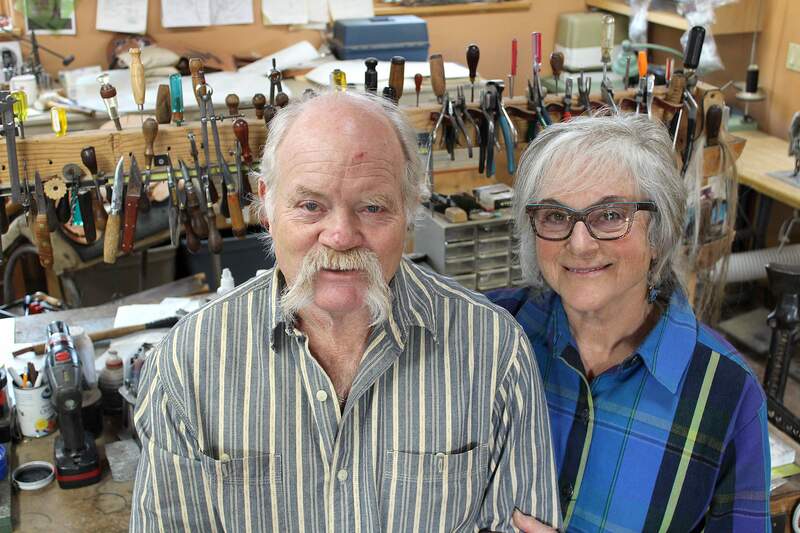 After attending UCLA, Lisa apprenticed with master saddlemaker Lawrence De Witt. Then Loren became her apprentice. 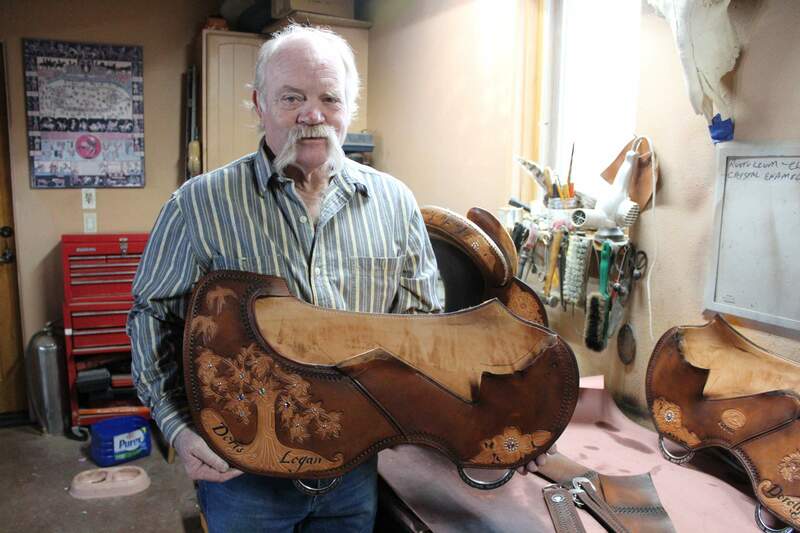 That was 1,000 saddles ago with each one crafted by their own four hands over the course of 43 years. 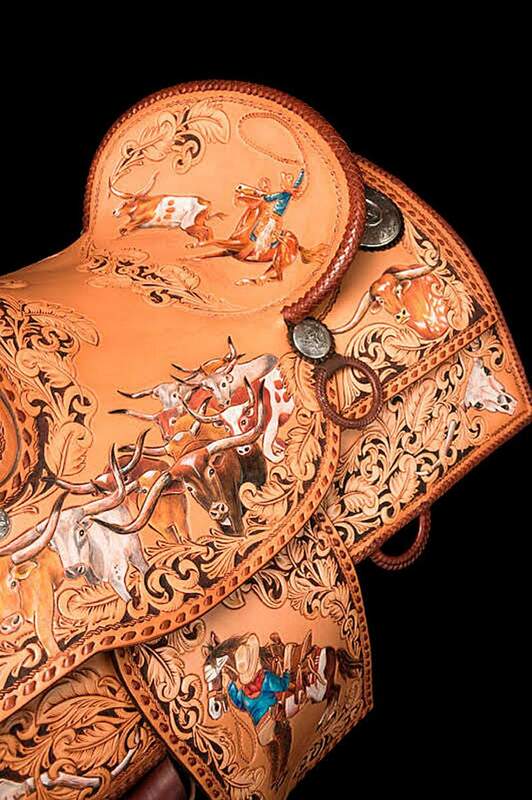 HHHLisa does the conception, the artwork, the design and Loren does all the braiding, stitching, oiling and saddle assembly, often with tools handed down from his harness-making great-grandfather. They both share in the structural construction. 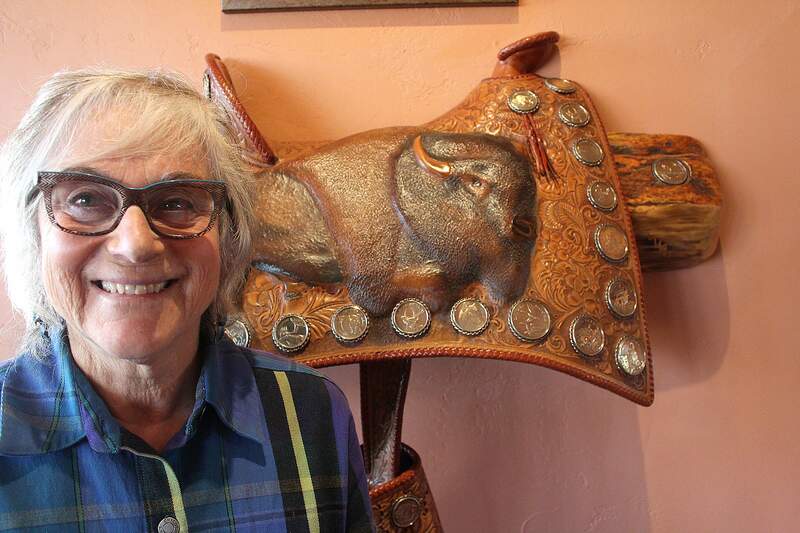 “We build the saddles together,” they tell me, laughing between cups of tea and coffee. 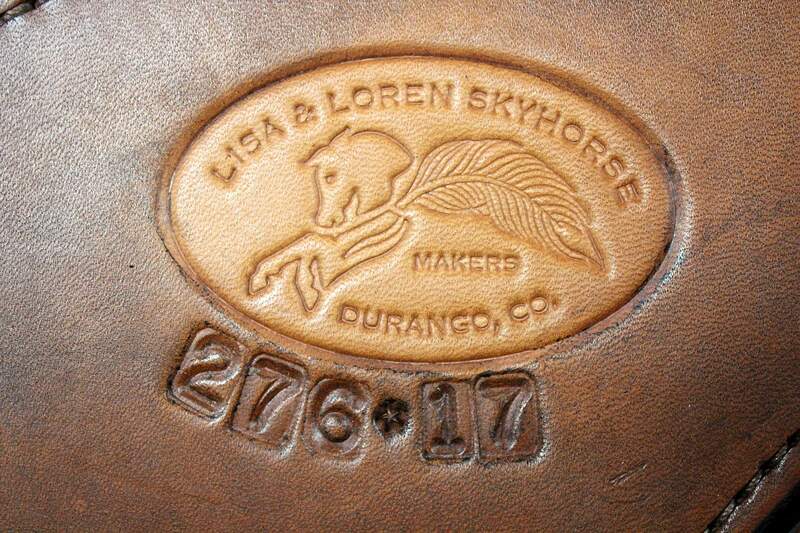 Each saddle is numbered and carries the special Skyhorse logo. 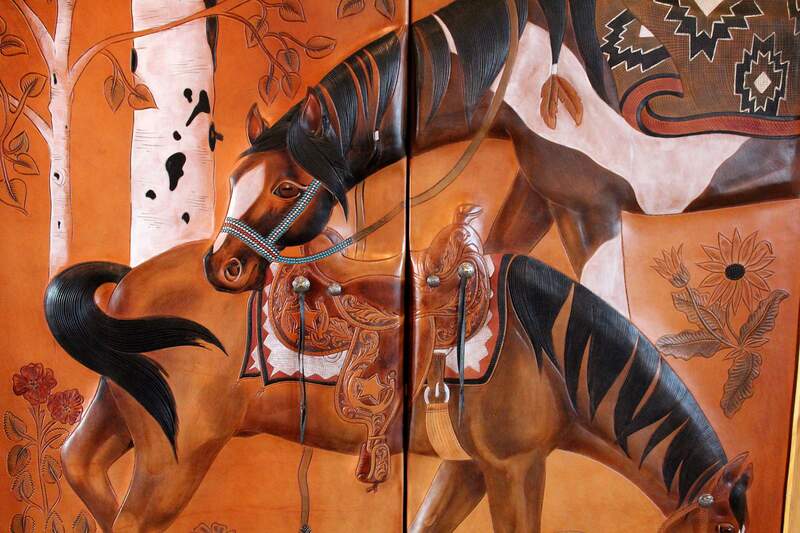 Twice the Skyhorses have traveled to Mongolia bringing tools, supplies and other equipment to create a shop so that traveling nomads can fix their own saddles as they journey across the world’s great grassy steppes. 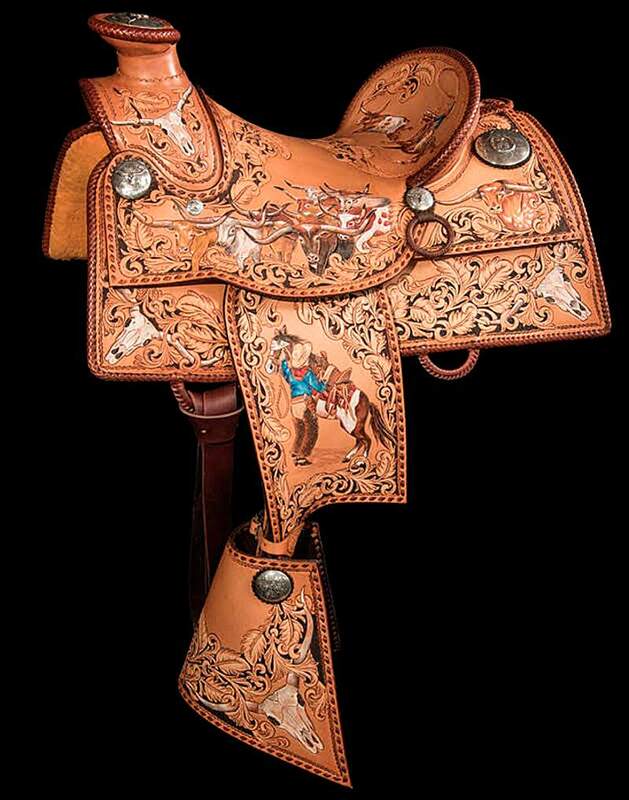 Devoted to riding, the Skyhorses have ridden local horses in remote corners of continents including the Altai Mountains in Siberia, where they also worked on a saddle project with local artisans who wanted to learn more about the distinctive American Western saddle, though their own saddle templates are 4,000 years old. 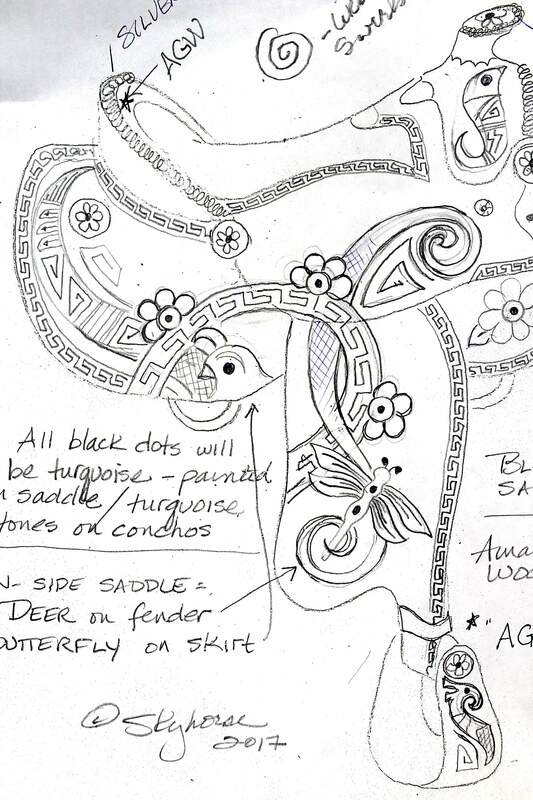 The leatherworkers replicated ancient Scythian designs from their ancestors to craft brass medallions as saddle decorations. The hand-rubbed and polished brass came from used plumbing parts.